Santiago feels like a city going through a makeover. Huge new office towers crowd out beautiful turn of the century estates. New metro subway lines have cranes all over town busy and under the Mapocho river is a new highway. It's the urban renewal of the old city. Architecturally, the city is a bit of a hotchpotch, thanks to a succession of earthquakes and a spate of undisciplined rebuilding in the 1960s and 1970s. Ugly office blocks and dingy galerías compete for space with beautifully maintained colonial buildings. It's not a place of excesses, however: homelessness is minimal compared to many other cities of this size, and there's no tension in the air or threat of violence. On the whole it's a good introduction to the country and its people, offering a pleasing choice of museums, markets, restaurants and nightspots, wrapped up in a friendly environment. Santiago is totally connected with the rest of the world for its airport, the International Airport of Santiago Comodoro Arturo Merino Benítez. It is in the commune of Pudahuel, only 25 kms. away of the center of the town, connected to the airport by two brand new highways. The airport is recognised as one of the best in the world and, without any doubts, the best of Latinamerica. Most of the airlines of the world land here and it is the host of LAN Airlines, member of Oneworld Alliance. Also, it have service for national flights, connecting all the country between Arica and Punta Arenas, including Easter Island. The international airlines with regular flights to SCL are: Aerolineas Argentinas, Aeromexico, Air Canada, Air France, American Airlines, Avianca, Copa, Delta Airlines, Iberia, Lan Chile, Lloyd Aereo Boliviano, Lufthansa, Pluna, Taca, Tam Mercosur and Varig. For more information, visit the webpage of the Airport or the webpage of the airlines. Other way to get Santiago is with car. Santiago is connected with the next roadways: Route 5 North (North Panamerican Highway, from Arica), Route 5 South (South Panamerican Highway, from the island of Chiloé), Route 68 (from Valparaiso and Viña del Mar), the Route 78 (Highway of the Sun, from the "Central Shore" and the port of San Antonio) and the Route Los Libertadores (from Los Andes and the International Route 60). From Argentina, you can use the most important andean pass: Los Libertadores. It unites the cities of Los Andes in Chile, and Mendoza in Argentina, under the Mount Aconcagua. From Peru, you can use the Chacalluta Pass to cross the Concorde Line (frontier) near Arica and then use the Route 5 to the South. From Bolivia, use the Tambo Quemado pass in the Andes to Putre and then go to Arica and use the Route 5 North. Santiago isn't only the most important city of the country. Also, it's the capital of the Región Metropolitana de Santiago (Metropolitan Region of Santiago), one of the 13 administratives regions of the country. It's a special region. All the others are called with a number from north to south. The RM haven't any number, it's the smallest of the thirteen and it's the only land-locked region. The Region have more than the 40% of the chilean population, have the more density of population, and it's the most developed region. The 41.5% of the National PIB is concentrated in the zone. The region have a mediterranean climate, with a dry summer (january) and a rainy winter (july). The region is limited by the Coastal Mountains in the west and the Andes Mountains in the east. In the middle is the "Valley of Maipo" or "Valley of Santiago", crossed by the river Maipo and its afluent, the Mapocho. It's a fertile and agricultural valley, where the corn, the wheat and the vineyards are the principal products. But the green fields are being replaced by the city and its metropolitan area. The most important authority of the region is the Intendant, designed exclusively by the President of the Republic. The actual Metropolitan Intendant is Mrs. Ximena Rincón. The region is also divided in 6 provinces and they in 52 comunas (municipalties). 34 of them form the "Gran Santiago", the Metropolitan Area. Provinces : Chacabuco (cap: Colina), Cordillera (cap: Puente Alto), Maipo (cap: San Bernardo), Melipilla (cap: Melipilla), Santiago (cap: Santiago) and Talagante (cap: Talagante). 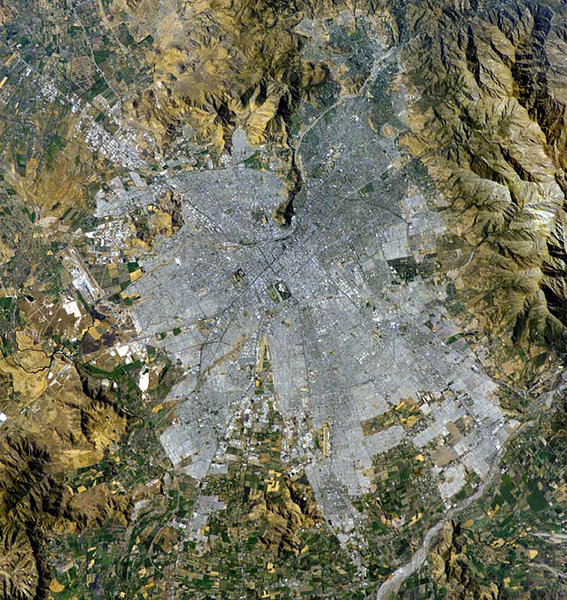 Santiago grew so fast that the road infrastructure wasn't ready to allow more than three million of habitants moving in the city. But with the time, the Government began to improve the situation. Pero con el tiempo, el Gobierno comenzó a mejorar la situación. 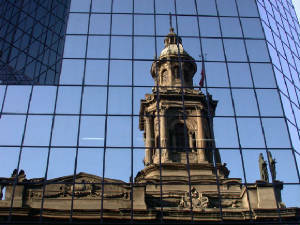 In 1978 was opened the first line of the subway, under the principal avenue of the city: the Alameda Bernardo O'Higgins. Soon, the line was extended. Three lines were released and now crosses more than 52 kilometers, allowing to milllions of people moving along Santiago. Metro de Santiago is very efficient, modern, relieable and safe. It is one of the best system of subways in the world. Also, different buses connect remote zones to the Metro. In the last years, a lot of urban highways were constructed in Santiago. At end of 2005, Autopista Central, Costanera Norte, Vespucio Norte and Vespucio Sur Express will be inaugurated, using a modern non-stop toll system.